A knife can be a very useful tool while diving. Originally added to the diver's equipment as a means of escaping entrapment from fishing line or kelp, the dive knife now also comes in blunt point so you can poke and pry without breaking off the tip of the blade. 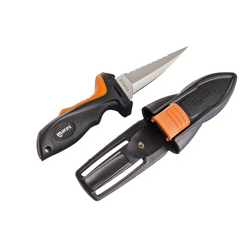 Whether you want a serrated or a straight edge, want to clip your knife onto your BC hose or strap it onto your calf, Dolphin Scuba has the perfect knife for you. Check out our selection and rest easy in the knowledge that you will be fully equipped the next time you make a dive.